Don't copy anything from my site without my permission! 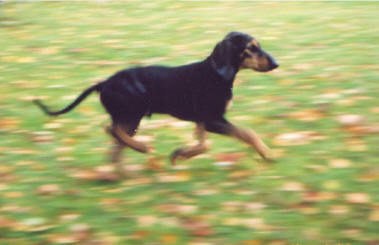 Fourth import: Morina di Pompiano, Nero di Pompiano, Turbo di Pompiano, Rosa (a pelo raso) and Tex. Fifth import: Lara di Pompiano, Leda di Pompiano, Chira and Rol. ​Sixth import: Ledy di Pontenizza, Lea di Pontenizza and Brina di Pontenizza (a pelo raso). At the moment we have about 60 Segugio Italianos here in Finland. Segugio Italianos have found their place here in Finland very well. 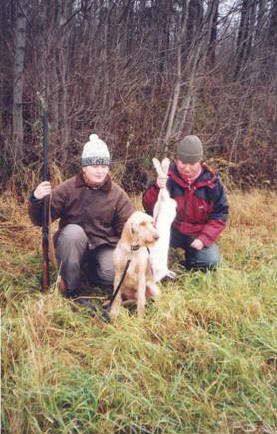 Dogs are used for hunting hares and foxes. Because of their lightweight structure they are very durable and able to work for long days while hunting. 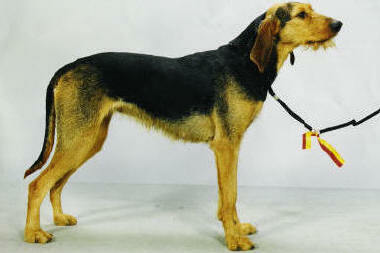 Segugio Italianos's hunting style is fast and they usually have manysounded and melodious bay. Segugio Italianos here in Finland are social, temperamental, adaptable and intelligent dogs. We haven't had any hereditary illnesses in our population in Finland. Hip x-ray has been made for some dogs and all the results have been A.
Teija Viljanmaa, Tanja Leinonen, V-99 Vigoroso Approbatur and hare. For further information, please don't hesitate to contact me by e-mail or call my mobile.